Confusion abounds concerning the nature of the unseen spiritual worlds of men an angels. Biblical terms such as Hades, Abaddon, the abyss and others are often considered interchangeable by well-intended students of God’s Word. In some cases, the message of the text is no worse for the wear. In others, flagrant apostasy has developed because of a poorly interpreted text. 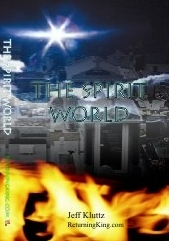 The Spirit World is a biblical study of the differentiations between numerous spiritual abodes of man and angelic beings. At a time past, man died he went to neither Heaven nor Hell, but rather to a place of temporary containment. The lake of fire remains empty today, but will be populated at the end of history. Demonic angels find themselves incarcerated in spiritual containers for particularly evil deeds. The Bible reveals a fascinating account concerning the journey of the spirits of created beings; one which is essential theological knowledge for rightly handling the doctrines of God’s word. Numerous are the terms used in scripture to reference the other-worldly spiritual abodes which remain unseen to the human eye. Some biblical students are content to quickly categorize these many terms into two simple categories: Heaven and Hell. However upon a thorough examination of scripture it becomes exceptionally clear that many of the abodes of spiritual existence in scripture are not synonymous with either Heaven or Hell. Hades, is often considered synonymous with Hell, for example, yet numerous Godly men, including Jesus himself, are noted in scripture to have entered Hades upon their deaths. While there are some who erroneously teach that Jesus went to “Hell” when he died (meaning “the eternal lake of fire”), scripture is unwavering in its clear assertion that in fact, Hell is not yet occupied. Hades is rather defined as something altogether different from the eternal abode of fire and torment. Other terms also exist in scripture which refer to locations other than the two final abodes of Heaven and Hell. These numerous spiritual containers include the habitations of the dead, both righteous and unrighteous, and/or angels, both righteous and unrighteous. Some of the unseen realms are temporary in nature and some are eternal. Some spiritual territories are uniquely fitting for angelic beings while others are for the spirits of man alone. Some realms, such as those of Heaven and the Lake of Fire, are fitting for both mankind and angelic beings. Having too simple of a theology concerning such terms as Hades, Paradise and the Abyss leads some to misunderstand scripture and others to re-write biblical theology entirely based upon false notions. The modern vast army of teachers have gone so far as to completely redefine soteriology (the doctrine of salvation) because of a lack of understanding of the distinctions between Hades and Hell. Their claim is that Jesus went to the Lake of Fire – the abode of eternal punishment for sin – in order to “pay” the penalty of sin by suffering the punishments of Hell. Scripture teaches quite contrarily to this false doctrine. While scripture decisively depicts Jesus entering Hades, one should be very careful to observe biblical teachings concerning the exact nature of that location before jumping to faulty conclusions. For, Hades and the Lake of Fire are not synonymous, as this work will thoroughly demonstrate. In many cases a singular English translation of scripture may fall short in providing the interpretational necessities of the biblical student concerning these terms. In the Old Testament, for example, it may be unclear whether one’s afterlife habitat is “Hell,” as the King James Version may translate, or “the grave,” as the NIV may reference for the very same verse. The term “Hell” certainly brings a vivid picture of eternal destruction to the mind of the modern biblical student, while the terms “the grave” do not indicate such a specific judgment to have yet been rendered. Furthermore, there are terms used in scripture depicting other realms, not of this world, for which the average biblical student has no formal understanding at all. Terms such as “The Abyss,” “Tartarus” or even “Paradise” can lead one to incorrect conclusions if not understood properly through systematic study. This work will define biblically, through careful and methodical study, the definitions of these numerous terms so that the interpreter of scripture may more completely understand the truths revealed in their usages. Such an understanding is mandatory for anyone who desires to rightly divide the Word of truth. A general credit must be given to scholar, Dr. Arnold Fruchtenbaum, for the framework which began the author’s pursuit into this field of study. In his short Bible study entitled The Place of The Dead, Dr. Fruchtenbaum led the author to his own examination and understanding of the conclusions of scripture regarding these terms. While this work will expand upon the conclusions of The Place of The Dead, that work has certainly contributed to the skeletal structure of a large portion of this book. The early chapters of this work will each focus on a biblical term in order to give a comprehensive understanding as to its nature. The latter chapters will examine the resurrections and judgments which cause each realm to migrate to its permanent and eternal state. Indeed, all beings, whether man or angel, will dwell eternally in one of the two permanent residences of Heaven or Hell. Yet, through history these two eternal places are depicted in scripture to have varying degrees of occupancy. In the ancient world before Christ, Heaven had not yet had its entry paid and provided for. And as of the writing of this work, Hell remains an empty burning lake, not yet opened for business. Thanks, Damon. It is actually available now. Let me know what you think after the read.